Pictured is Aust.Ch. 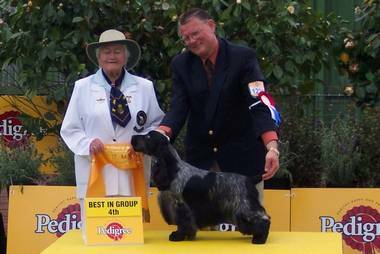 Ryangaye Rhythm N Blues winning Fourth Best Exhibit in Group at Melbourne Royal 2004 with an entry of over 800 Gundogs. This dog is a multiple Best Exhibit in Group/In Show & Speciality winner has provided us with many memorable & exciting wins. We would like to thank Gaye Allen for her foresight in breeding this wonderful dog & also to Ann & Dennis O'Keefe whom have made it all possible.